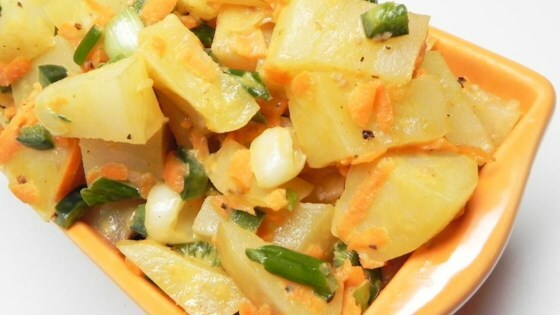 "The use of the microwave to cook the potatoes is not only speedy but saves energy. This was my experiment, and we liked it a lot. Serve warm or chilled." Place potatoes in a 2-quart microwave-safe casserole dish. Microwave on high, stirring halfway through, until tender, about 9 minutes. Drain any liquid that may have accumulated. Mix Caesar dressing, carrots, green onions, Hatch chile pepper, salt, and pepper together in a large bowl. Stir in potatoes. I used russet potatoes because I happened to have them on hand, but usually I would recommend Yukon Gold or red potatoes for salad.